You don’t have to venture far from the Holden House’ front door to discover some out-of-the-way beautiful places to bond with nature in the Pikes Peak and Colorado Springs area. Here are some of our favorite picks that are sure to give you amazing opportunities to “take a hike”! Red Rock Canyon Open Space – The history of the City of Colorado Springs Red Rock Canyon is a story of people making use of the area’s resources, location, and topography. The high Dakota sandstone hogback with its steep east face provided the Utes with places to stand watch over the plains from defensible positions. Gypsum mines and stone quarries provided building materials for Colorado City and the developing West. Proximity to the Colorado Midland Railroad facilitated the shipment of building stone and led to the construction of mills at the base of the hogbacks for milling Cripple Creek gold. The Red Rock Canyon trail system includes a 3.72 mile history theme trail loop. The master plan map below shows this trail. Historic sites on the map are numbered to correspond to the numbered story links. Interpretive signs are located at the 31st Street Trailhead and near the open air pavilion. Paint Mines Park – Relentless prairie winds, sandstone-capped spires and hoodoos, colorful hues of clay, and distant coyote calls beckon visitors to this quiet landscape. 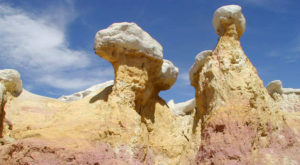 As hikers venture from the trailhead into the distant reaches, the Paint Mines offers a journey through time, past fascinating geological formations and remnants of human history, in a unique ecological setting within the rolling plains of eastern El Paso County. The Paint Mines Interpretive Park, located in Colorado’s eastern prairie, is a rare, geologically fragile, and ecologically rich landscape of labyrinthine gulches and monoliths, perennial wetlands, and native grass meadows. The park contains unique geological, archeological, historical, and ecological resources that are all interrelated, thereby retaining significant educational, scientific, and interpretive value. Bear Creek Regional Park – Set in the foothills of Pikes Peak, El Paso County’s Bear Creek Regional Park offers a pleasant escape within the city limits. This 545 – acre regional park supports a nature center picnic pavilions, playfields, tennis courts, playgrounds, archery range, horseshoe pit, volleyball and basketball courts. Additionally, ten miles of multi-purpose, non-motorized trails wind through the park. Our suggestion: start at the Bear Creek Nature Center off of 26th Street and Gold Camp Road to get your bearings before venturing off. 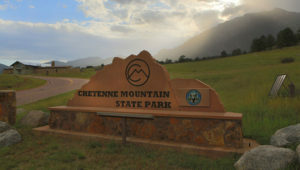 North Cheyenne Canon Park – The City of Colorado Springs North Cheyenne Cañon is rich with both elements of man-made and natural surroundings on the 1,600 acres of this regional park, owned by the City of Colorado Springs. 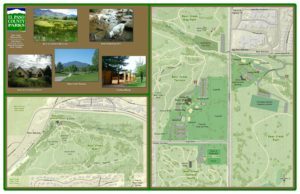 Included on it are two Visitors Centers including the Starsmore Discovery Center and “The Cub”, or Helen Hunt Falls Visitors Center, both of which are open to visitors in the summer months and are a great place to start learning the area by getting a trail and nature map. Cheyenne Mountain State Park – With an amazing 2,701 acres, this State of Colorado’s Park lets you explore nature’s diversity with prairie-to-peak ecosystems with over 21 miles of hiking and biking trails. The Limekiln Trailhead offers parking with quick access to the trail system with restroom facilities, picnic tables, and a playground for the kids. Continue up the road and find 41 day-use, handicap accessible, picnic areas each with its own table and grill. From here, there is ​​​​​​easy trail access and views to astound you! *Information and photos for this blog provided through each of the local and state public and “friends” park websites with credits and direct links to each entity. This entry was posted in adventure, birdwatching, cheyenne canon, hike, hiking, historic, Holden House 1902 Bed and Breakfast Inn, nature, open space, parks, pikes peak, Pikes Peak birding, red rock canyon, Wildlife and tagged Bear Creek Regional Park, Cheyenne Mountain State Park, Holden House 1902 Bed and Breakfast Inn, North Cheyenne Canon Park, Paint Mines Interpretive Park, Red Rock Canyon Open Space by admin. Bookmark the permalink.